Rosacea is a chronic inflammatory condition that causes redness and bumps on the face, neck, and chest. We understand that rosacea can be embarrassing because it affects areas of the skin that are visible to others. We also realize that rosacea can cause discomfort. Therefore, we utilize medication, pulsed dye laser treatments, chemical peels, and lifestyle modifications to reduce symptoms and restore your confidence in your skin. Rosacea affects both men and women, typically between the ages of 30 to 50. It varies in severity, but almost always causes background redness on the cheeks, nose, forehead, or chin of affected individuals. This redness can worsen when exposed to certain triggers. Intermittent inflammatory and pus-filled bumps are another common symptom. Treatment is designed to combat the specific type of rosacea that affects the individual. Three types of rosacea we commonly treat at our practice are 1. telangiectatic rosacea, 2. inflammatory rosacea, and 3. ocular rosacea. We use a combination of oral & topical medications, lifestyle modifications, laser and light therapies, chemical peels, and surgical procedures to give you the best results possible. Telangiectatic rosacea causes background redness and involves a tendency to flush or blush easily. It can temporarily improve with topical medications, like Mirvaso ®, that aim at reducing facial blood flow and background redness for several hours. Permanent reduction of background redness can be achieved with pulsed dye laser (Vbeam) treatment. Retreatment every 7 to 10 years can be performed as new vessels form or dilate due to the underlying inflammatory state. 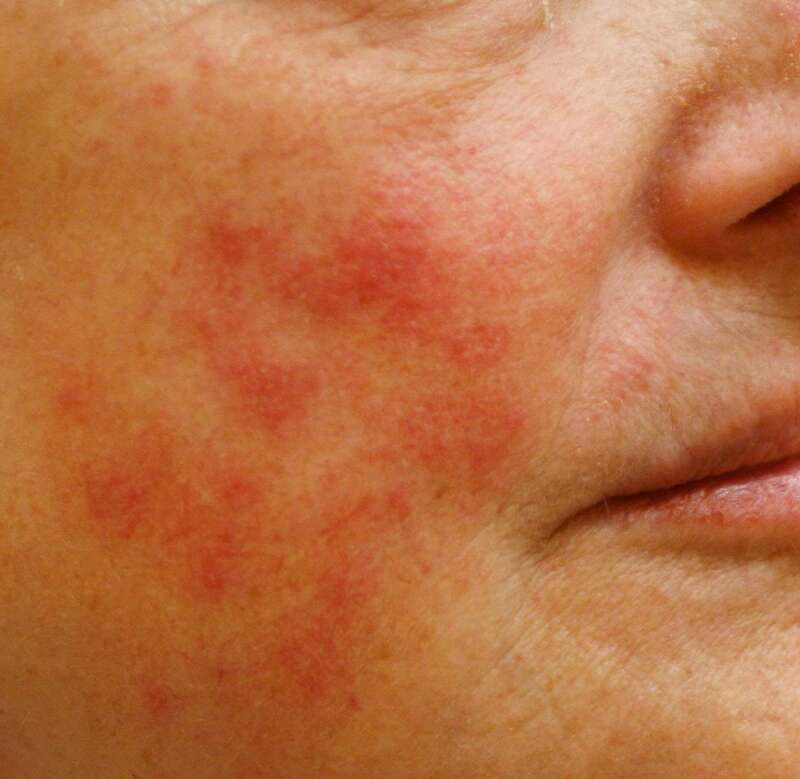 Inflammatory rosacea causes persistent redness, pimples, and visible threadlike blood vessels in the center of the face that can spread to the cheeks, forehead, chin, and nose. Topical azelaic acid, anti-mite, or antibiotic creams can effectively reduce the inflammation that is caused by this type of rosacea. Quelage peels, performed in the office, can also help to calm inflammation. When topical treatments are not enough, low dose oral antibiotics, such as doxycycline and Oracea ®, can be used in combination with topicals to help reduce inflammation. These oral antibiotics are safe to use because they function at a sub-microbial dose, meaning that you benefit from their anti-inflammatory properties without endangering the good bacteria in your intestines. 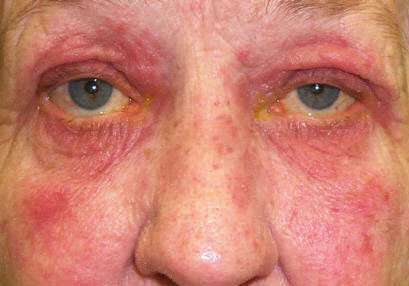 Ocular rosacea causes burning, itching, or watering of the eyes. We can improve these symptoms with artificial tears or cyclosporine eye drops. Oral antibiotics can also be used for symptomatic and worsening eye involvement. Common triggers that can worsen rosacea symptoms are stress, anxiety, heat (from sunlight, shower, or exercise), food (spicy or hot), alcohol, and weather changes (hot, humid, cold, and wind). While avoidance of these triggers can help prevent rosacea flare-ups, we realize that complete avoidance of all triggers is sometimes impractical. Additionally, not everyone with rosacea is affected by all of the above triggers. Therefore, we recommend that you keep a daily diary to identify your specific triggers. Furthermore, we encourage all individuals affected by rosacea to wear sunscreen with UVA/UVB protection, wear sunglasses, moisturize dry skin, control indoor temperatures (especially when exercising), stay well-hydrated, and manage stress. I just started used Mirvaso for severe redness and it is working but I am not breaking out with the little pimple like imflamation on my cheeks. I also have used and still use at night the Metrogel which will work when used for a long period of time. I was wondering if I could use these 2 medications together or should I just use the metrogel at night and the mirvaso during the day? Thanks so much for your answer. Tiny little pimples or pustules on the cheeks in individuals with rosacea are the hallmark of inflammatory rosacea. Common topical treatments for inflammatory rosacea are Soolantra and Metro-Cream in people with dry skin, and benzoylperoxide, Finacea or Metro-Gel in people with normal or oily skin. Mirvaso or pulsed dye laser treat only the widened blood vessels that show as the red background skin in rosacea. Treatments for the red background as well as for inflammation can usually be used at the same time. Hello Dr. Ringpfeil, For the past few years I have suffered with Rosacea with mild acne on my cheeks (I do have some mild scars leftover from acne during my teenage years 15-20 years ago). I’m very interested in receiving pulse dye laser treatment and am curious if this is something that would work on this condition for my current rosacea and cheek redness. Pulsed dye laser is exactly for the cheek redness with rosacea. After several treatments 4-6 weeks apart, this background redness is much improved and results stay for several years. Pulsed dye laser treats the inflammatory component of rosacea, which are small red bumps with or without pus, only temporarily. Inflammatory rosacea requires proper hydration of your body and skin, proper sun protection and might even require topical oral anti-inflammatory treatments. (1) I’ve seen photos on the Internet of red blotches/bruising on the skin. Does this indicate stronger and therefore more effective treatments? Or can treatments be just as effective without the bruising? (2) I am trying to become pregnant. Could I still have the laser procedure? Also, regarding Mirvosa, I’ve read that it can be extremely effective, but also read anecdotal stories from patients of terrible rebound effects. What is accurate regarding the drug? Bruising with PDL can be avoided since the V-beam perfecta was created in 2005. However, some people may still develop red blotches can last for several weeks (not bruises). In general, we discourage any elective treatment during a pregnancy. PDL can safely be performed before you get pregnant. Mirvaso is indeed very effective as an anti-redness medication. The “rebound phenomenon” described by several who have used it might be true in very few cases. Most of the time, Mirvaso was used at the onset of an inflammatory flare to reduce concomitant redness. The flare progressed because it was not adequately treated by anti-inflammatory agents and the anti-redness treatment cannot treat inflammation. Background redness is a very common trait in rosacea. It is not known whether it worsens over time. Several factors influence facial redness, specifically heat, sun exposure, stress and certain foods. Long term reduction of facial or chest redness associated with rosacea can be achieved with a series of 3-5 laser treatments. Intense pulsed light provides excellent short term results when you do not have a lot of time before an important event. Periodic maintenance is needed to sustain results. A topical cream “Mirvaso” provides immediate results that last 8-12 hours. Please note that reduction of facial redness by any of these means does not influence your inflammatory rosacea (small bumps). They are best corrected with stress reduction techniques as well as anti-inflammatoiry topical peels, gels lotions or creams or oral probiotics, oral niacin/mineral combinations supplements and anti-inflammatory medication. If you have rosacea, will insurance cover the cost of the laser treatment? What treatments for rosacea are covered? Laser treatment for rosacea is highly effective for reduction of background redness and enlarged capillaries. While it can temporarily improve breakouts in some with inflammatory rosacea, it is not a standard treatment. Unfortunately, laser treatment is not covered by insurances for either indication. Insurances cover prescription medicines for inflammatory rosacea such as topical and oral antibiotics and ant-inflammatory agents. Some insurances may even cover a topical prescription medicine (Mirvaso) that reduces redness for 8-10 hours during the day.